A picture’s worth a thousand words, and a damaging, embarrassing, or scandalous Facebook picture can be a career-ender (not to mention a personal nightmare). Just look at the case of Ashley Payne, a teacher who was fired after her employers found photos of her holding beers on Facebook. 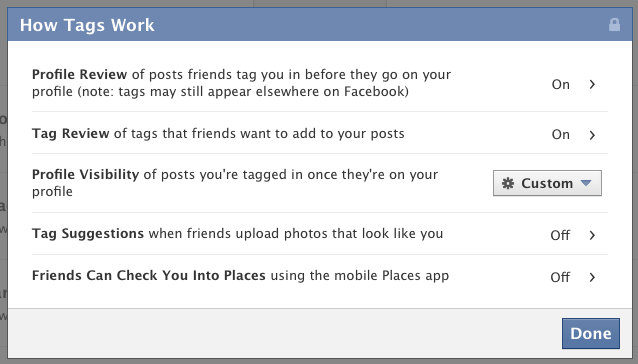 Although Facebook overhauled all of its privacy settings in August 2011, we’re focusing only on photos. 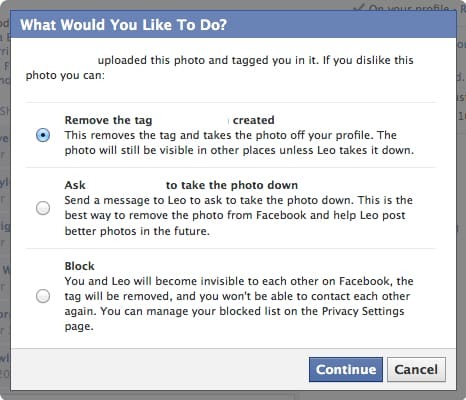 Here’s what you need to know to save yourself from a future Facebook photo firestorm. Detagging just got a lot more complicated, but you can use it to your advantage. Instead of merely detagging like you did under the old privacy settings, detagging now has multiple steps: it combines reporting violations with detagging. Detagging isn’t just one step anymore. But let’s keep it simple and tell you what to do if you just want to detag a photo of you. First, go to the photo you want to detag and click the “remove” link. The window above will pop up. Then select “I want to remove this tag,” then hit the “continue” button. And if you’ve never gone through all of your tagged photos to detag the bad ones, now’s the time. Get to it! Once you choose to detag, Facebook now offers you new privacy options. Don’t get too excited: this feature is just a roundabout way of making you directly message the person who posted it and asking him or her to remove it. Seriously. Clicking the button just opens a Facebook message window that’s pre-addressed to the photo poster. 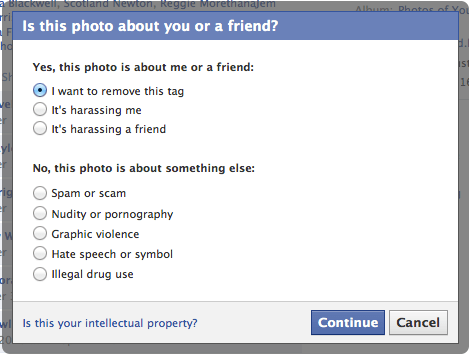 It looks like Facebook is trying to privatize photo takedowns with this option. After all, their notoriously unhelpful compliance department is being inundated by thousands of reports of abusive content each day and can’t seem to keep up. Forcing users to deal with each other, rather than the Facebook middleman, looks like an attempt to shirk some of their work. You can change your photo privacy preferences in the “How Tags Work” window. Would you rather A), let anyone (anyone, not just your friends) tag you in any photo without your approval; or B), be able to look tags over before they’re posted to your profile? If you care at all about privacy, B is your answer. And yes, anyone can tag you now. 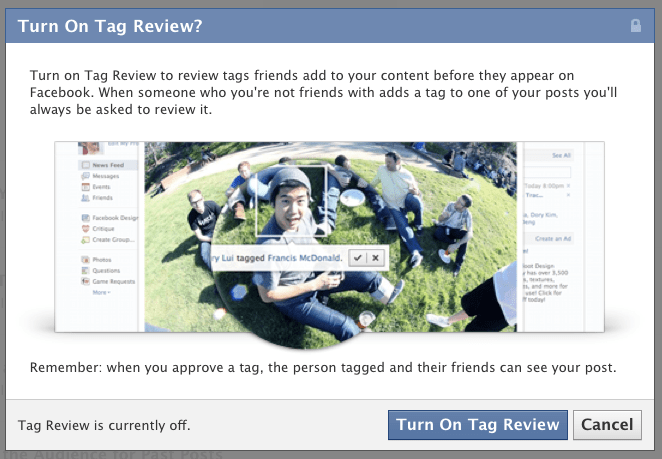 Facebook quietly slipped in this tag free-for-all alongside tag review. How a pending tag appears in Facebook. Make sure tag review is enabled. Detag or report, all in one place.